In Pathfinder Worldscape the fantasy adventure crossover event kicks off as the Pathfinders are drawn into the mysterious Worldscape. The greatest warriors of Hyboria, Barsoom, Golarion and Earth clash in an ancient battle of life and death. 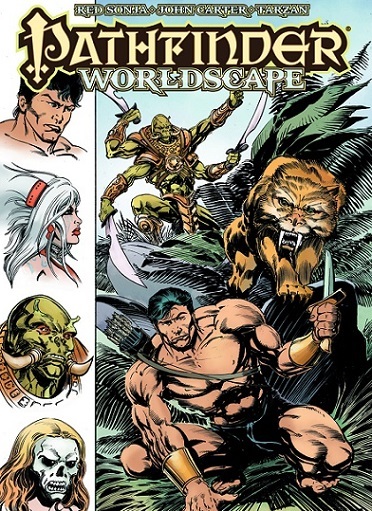 This magical tale introduces Tarzan, Red Sonja and John Carter of Mars, to the universe of Worldscape role-playing games. In Pathfinder Worldscape #2 The Scepter and the Crown. The legendary heroes fight to survive in the forbidden jungle of the inter-dimensional Worldscape. Seoni lends her magic to the mighty Tars Tarkas of Barsoom and his savage ally Thun’da to help them discover the secret of a multi-world gorilla super-army. Co-starring the jungle goddess Fantomah! The writer behind the series is Pathfinder publisher Erik Mona, the art work is provided by Jonathan Lau. The 2nd edition will be published by Dynamite on November 16th.